Duncan Stuart discusses Canberra musician Jim Dusty’s thematic inspiration and the struggle between creativity and financial stability. George Orwell argued that modern life and creative life do not mix because you are either too poor to make art, or too busy. This dilemma is at the heart of his 1936 novel Keep the Aspidistra Flying. 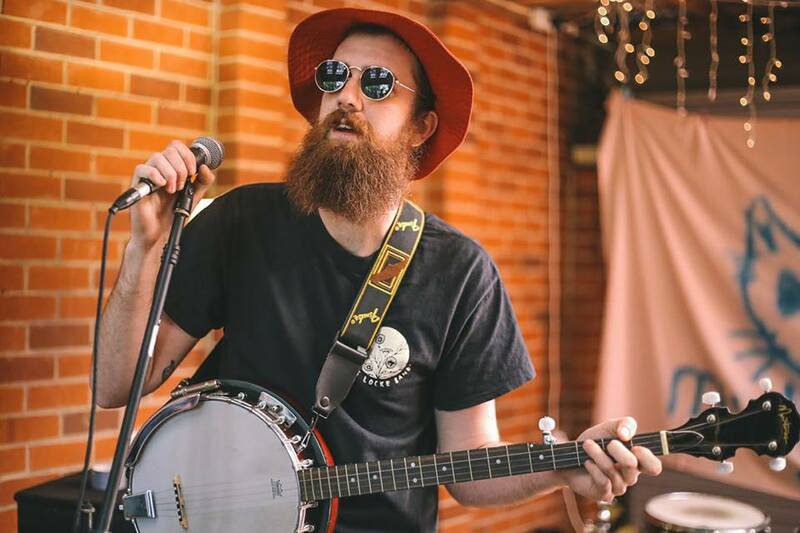 Orwell’s novel on poverty inspired Canberra’s own Banjo-wielding Jim Dusty to release a five song EP, Words of Prey, that speaks exclusively of being down and out in Canberra and Goulburn. Jim Dusty is the solo project of Jimmy Marchet, a sometimes-Goulburnian-sometimes-Canberrian. Jimmy normally sticks to varieties of music that are both loud and intense (he’s best known for playing in Fight Milk, Propeller and Monoceros). As Jim Dusty, however, he plays subdued and melancholic tunes. The intensity lies in the lyrics, focused on the financial struggles of life as a young member of the lower-middle class, drifting from withheld Centrelink payments to inconsistent casual work. It is a world of financial instability where savings are eaten away by poor habits, broken vehicles and underemployment. Words of Prey offers a snapshot of this aspect of Jim Dusty’s world, a world shared by around 8% of Australians who are currently underemployed. This is a world where everyday purchases become matters of anxiety and doubt. It is exactly such a world Orwell set out to capture in his character Gordon Comstock, the hero of Keep the Aspidistra Flying, who Jim Dusty bears some resemblance to. Jim will leave work early if possible and work a dead-end job with flexible hours if it means less money but more time to write and practise music. For Jim Dusty, the importance of money infuses his lyrics. He sings of enthralled bankers, the money-god (a phrase lifted straight from Comstock’s mouth and Orwell’s pen), and apocalyptic billboards. Jim juxtaposes symbols to be despised, “a world of corruption” that “trickles down”, with the need for whatever financial security he can acquire lest he face the consequences of being completely down and out, closing the first song the EP with the bleak lines “to live outside the system is to die on the streets or in jail”. Orwell wrote stories about capitulation. In the end Gordon Comstock submits himself to the idle life of the middle class, and gives up on writing. Indeed his new, secure, ‘successful’ life necessarily entails the end of his artistry. Likewise, the world of casual work that enables the time Jim Dusty has to write and play music could be cut short by the ending of his financial instability. As Orwell understood, it is a horrid decision, indeed it forms the central tragedy of Keep the Aspidistra Flying. The last and title track of Jim Dusty’s EP takes on the theme of anxiety and capitulation. For Jim, the song is about anxiety, about giving up on chances due to fear of failure; “stay low to the ground and try to keep your head down”. The haunting final image on the EP, before Jim yells out one last strangled chorus, is that of “buildings so high that they block out the sky with billboards to remind us that the end is night.” Above Jim’s personal crisis looms the architectural figures of late capitalism, ominous and inescapable. Unlike Comstock, Jim’s story hasn’t been written yet. Whether he will capitulate and become Jimmy Marchet once again remains to be seen, but his EP is an honest and provocative testament, equal measures personal and universal, to the struggle between creativity and security that afflicts modern life. Jim Dusty’s EP, Words of Prey, is available for pay what you want on bandcamp. His next show is on March 17th, at No Front Fences 2017, but he is happy to play anywhere. Your house maybe? Duncan Stuart listens to, reads about and attempts to play music. Caption: Jim Dusty at Macleay Farm. Photo by Dave McCarthy.